Ever since its launch in India, the Innova has maintained its No. 1 positioning in its segment. Often referred to as a segment creator and better known to be synonymous with MPVs in India, the Toyota Innova is one such iconic brand which is not just the pride of Toyota but the pride of over 6 lakh owners of Innova in India. Now, with the new Innova Crysta, we intend to take this commitment a notch above by giving our customers the best Innova possible in terms of powerful performance, luxurious features, comfort and most importantly safety. The new Innova ‘Crysta’ is sure to get everybody excited. Toyota has always been a front runner in leading the MPV segment since its launch in India, first with the Qualis and then with the Innova. 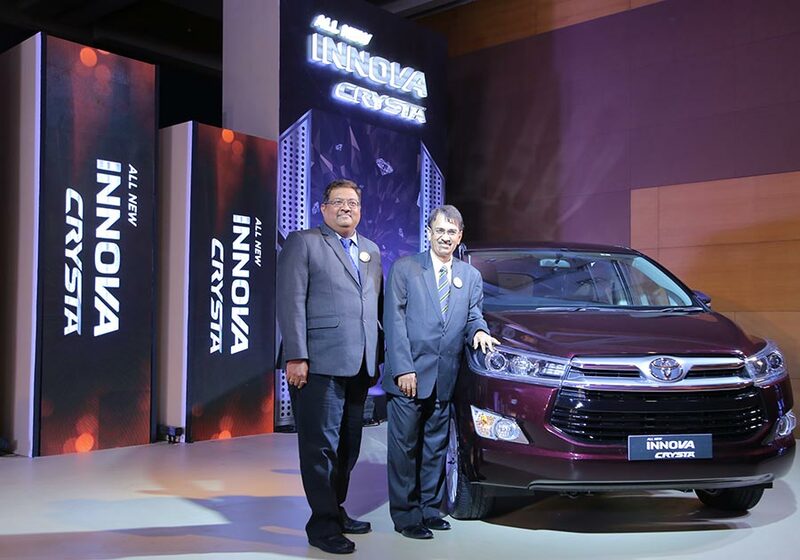 After 11 years of being India’s No: 1 MPV in the country, it is indeed a proud moment for all of us at Toyota to bring to you the all new Innova Crysta. It’s undoubtedly the most awaited launch in India and we are thankful to our loyal customers for their persistent support and trust in the brand Innova. The Innova ‘Crysta’ has been crafted with thoughtful features and great attention to detail, that combines revolutionary technology and sophistication of Toyota. Safety being one of the most important aspects in all Toyota vehicles, we have standardized 3 SRS Airbags along with ABS, EBD & BA across all grades in the new Innova Crysta. As we present the 2nd Generation of Innova, we are certain the Innova Crysta will continue to carry forward the brand legacy. Competitively priced in the range of Rs. 13,83,677 and Rs. 20,77,930 (Ex-showroom Mumbai), the new Innova Crysta deliveries across India will begin from today. The Innova Crysta will be available in two grades with an automatic transmission (Zx & Gx) and four grades with manual transmission (Zx, Vx, Gx & G). The Innova Crysta comes with an All-New Frame and an all-new 2.8 L diesel engine for the first time with an All-New 6 Speed Automatic Transmission with sequential shift. It also offers an all-new 2.4 L diesel engine with an all-new 5 speed Manual Transmission. The Innova Crysta gives Best-in-class performance of 174 PS and 360 Nm torque while offering fuel economy of 14.29 Km/l for the 2.8L 6 speed automatic transmission variant and 15.10 Km/l for the 2.4L 5 speed manual transmission variant. (As per ARAI certification). Refer full details of Innova Crysta and check out the colors offered.